A ‘decent’ espresso machine is still at the top of my to-buy list, which makes me sad, but I shouldn’t despair since their are many other cheaper alternatives. They may not offer the same intense taste of an espresso, but they do offer unique tastes and brewing experience that can often be overlooked when you have the conveience of a quality machine. The following list I hope will introduce you to new ways of brewing your coffee, and if not I hope it will give you some pointers on how to do it properly. If you’re a coffee fan I urge you to try as many of these as possible. So you’ve got your beans and a decent grinder, now you need to decide how your going to brew your cuppa, so lets start with the most simple and widely used way of brewing coffee. My first taste of fresh coffee came from one of these pots and I still love to pull it out from the back of the cupboard from time to time. Don’t think for a second that coffee geeks and connoisseurs don’t enjoy well made coffee from a french press. Make it correctly and you can get some amazing results from these little brewers. Don’t forget that they are also great for brewing loose tea! So I imagine everyones first question is, how much coffee do I use? Well I’d like to refer you towards the Has Bean brewing guide. They use 75g of course grind coffee per litre of water. With brewing coffee consistency is key, so I’d recommend using scales and timers as much as you can. I can’t take any credit for these measurements but I do think they are a great starting point from clever coffee brains better than mine. If the guide doesn’t perfectly suit your taste, play about with your timings until you receive the desired results, but make a note of what suits you. Maybe my favourite method of brewing, which produces a very strong and rich coffee. A lot of people call this an espresso brew but they are wrong, it takes 15 bars of pressure to create a ‘proper’ espresso, anything less then it isn’t. The Moka Pot only produces about 1.5 bars, but this doesn’t mean it isn’t delicious! This time I’m going to give you my guide to brewing the perfect cup with your Moka Pot. Unscrew the Moka Pot and fill the basket in the middle with medium grind coffee. Level the coffee with the top of the basket, but do not tamp it down. Fill the bottom half of the pot with the boiled water, make sure you only go up to the line, if it’s not got a line then just below the valve. Put the basket on top and screw the pot back together. Place the pot on a medium to high heat on one of the smaller hobs. Open the lid and wait. As soon as the coffee starts to trickle in to the top half, turn the heat down to low, this slows the extraction process and makes sure you get the best out of your beans. When the pot starts to spit or gurgle instantly take off the heat. Pour in to a warm cup and enjoy. This is my ‘on the go’ brewer. Its a very simple but brilliant device, its a plastic plunger that allows you to manually apply pressure to force brewed coffee through a filter paper. I’d say that it produces a very clean french press tasting cup. One of the biggest advantages to the Aeropress is the clean up process, once plunged you end up with a ‘puck’ of extracted coffee grounds that easily pop straight in to the bin, leaving the device free of any mess. This is the first one on my list that I have yet to try. The Kalita Kantan is a cheap disposable drip brewer. Simply unfold the paper and cardboard and place it on top of your cup, fill the pouch with 15g of ground coffee, and then pour your water over the top. It doesn’t get much easier or portable than that! If you enjoy strong espresso type coffee then you’ll love turkish coffee. The only problem you may face here is creating the ultra fine flour style grind. Luckily enough my Hario Mini grinder can just about manage this with a little elbow grease. 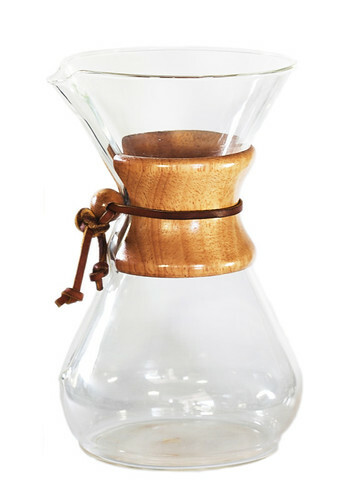 The Chemex is maybe a somewhat snobby way of brewing your coffee, but I can guarantee you that people will be very impressed when you serve your coffee in a Chemex! The Chemex is basically a coffee dripper on a big scale, using filter papers and a specially designed carafe to can create some of the best brewing results there is, I know that it is really highly regarded amongst many coffee geeks. Now this is without doubt the most impressive way to brew coffee. Siphon Filters usually originate from Japan, who are actually the worlds biggest coffee drinkers (so they know a thing or two). Now I don’t think that I can explain how these actually work, its sort of a mixture of the Moka Pot, Magic, and the Chemex. The video explains it much better than I could. Now they are noteriously difficult to get right, but I’m sure it will be good fun trying! I hope that I’ve introduced you to some new tecniques, if you have any advice of know of any others I’d love to hear from you.